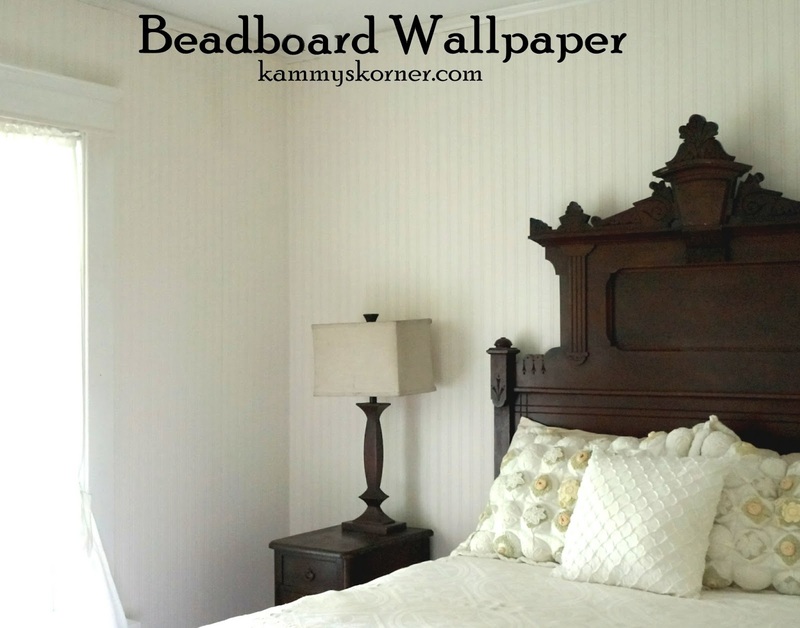 Kammy's Korner: Beadboard? No, It's Wallpaper! So, I held onto the paper, sure I would find another use for it. I did! 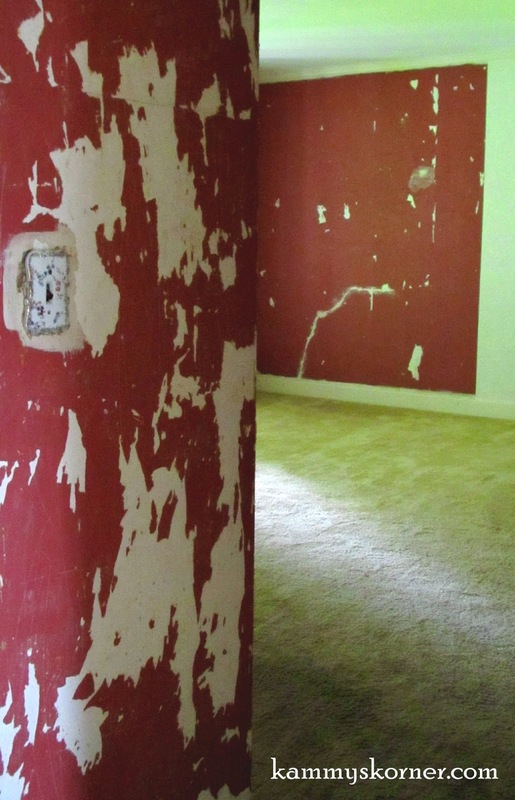 The previous owners had graciously removed (most of) the white on white wallpaper that was on the walls, only to reveal a big honking mess of plastered walls! It looks like they tried in vain to get the red paper(?!) off but to no avail. At least that's what I'm assuming went down. Same story here! 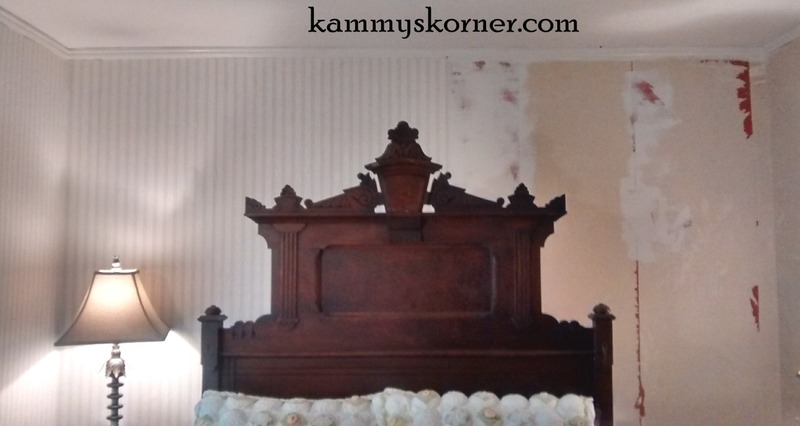 I used the steamer we had rented and the pic shows about the biggest piece I managed to get off with it! 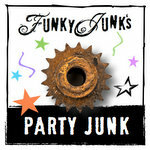 We would have been at it all month! 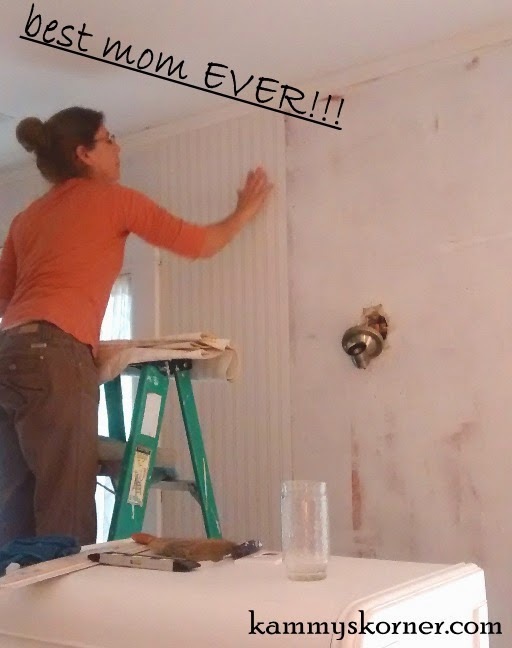 Well we covered up the junk on the kitchen ceiling, why not just "cover up" the junk on the wall? The paper was considerable cheaper to by at Menards than anywhere else I found it. I saved this project for my expert-wallpaper-hanging mother when she came to visit from Iowa. 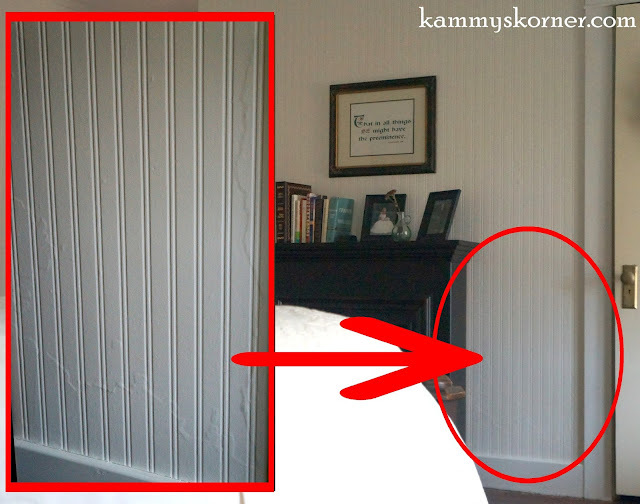 The paper ripped pretty easily so you had to be careful when hanging, but other than that you can't get much easier than stripes for matching! This is a close up of the worst spot. 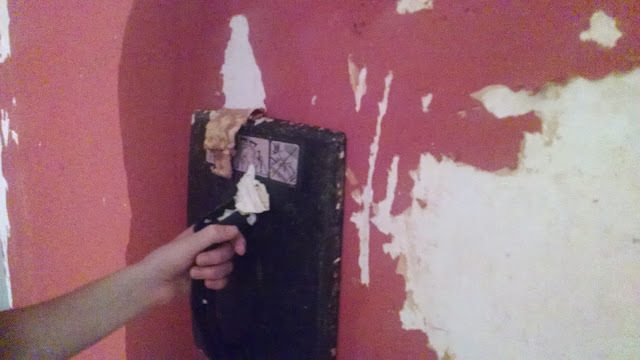 If you look closely, and I did enhance the photo a little so it would show up better, but you can see the edges of the ripped red paper and bad plaster and whatever it is. One other problem spot, something bled through on the paper. Thankfully it is only in this area and it is right under the window and it is not noticed unless I point it out. SOOOOO relieved it didn't happen in a focal point!!! I'm sure I could paint some Kilz or Bulls Eye over it and it would be fine. But for now, I'm leaving it, because you don't really see it with the curtains and all. 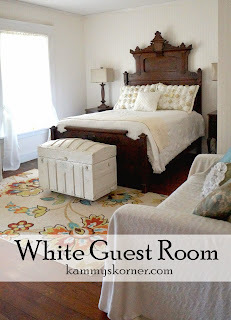 To view the whole guest room makeover reveal, click here! I love how this looks! 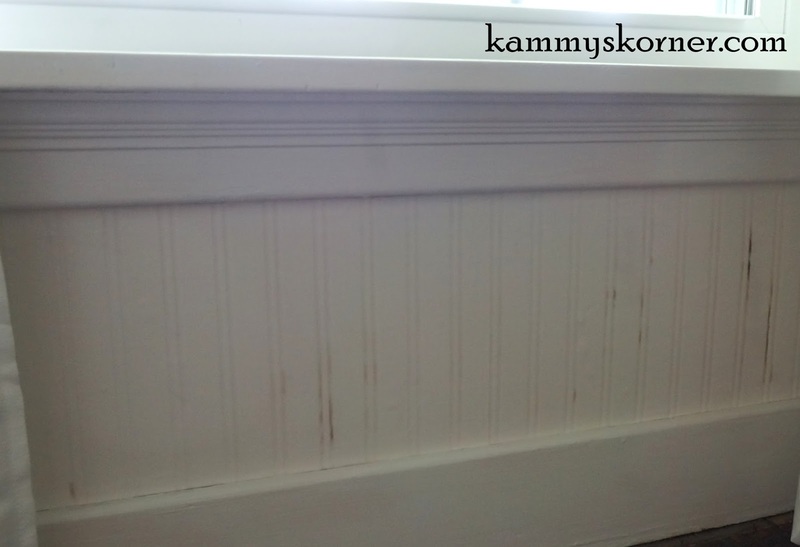 So unfortunate about the bleed-thru, but you're right-with the curtains no one will probably ever notice! Wow. The "before" was about as bad as it gets, and the "after" is stunning. 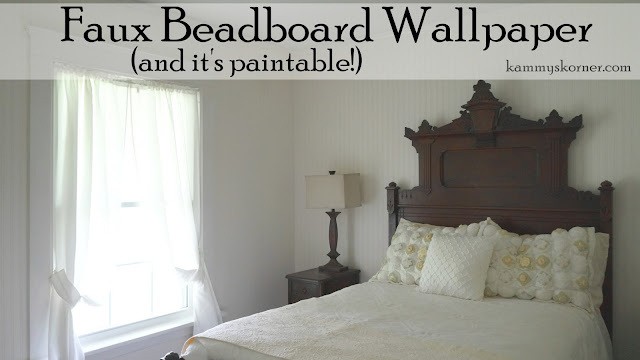 What a huge impact the (faux) beadboard has on the character of the room. It's absolutely beautiful.